I LOVE biscotti, but Taste Tester has never really bothered with it. Biscotti tends to have nuts, which he can’t eat, and he’s also not crazy about the dry texture. But I think after whipping up a batch of Peanut Butter & Co’s Peanut Butter Biscotti with the addition of Askinosie Bittersweet Chocolate Chunks and Roasted Cocoa Nibs, I may have won him over. Now that I think of it, I’m not sure I’ve ever had peanut butter biscotti before. Most flavors that I come across have almonds or hazelnuts in them. Peanut Butter & Co’s recipe called for semisweet chocolate and chopped peanuts, but I upped the chocolate quotient by using a darker chocolate and replacing the nuts with nibs. If you’ve never tried baking with (or eating) nibs before – this is a perfect application for them. 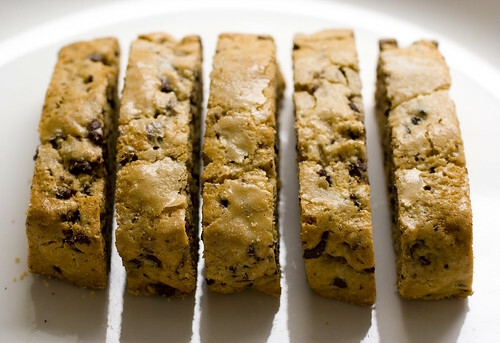 The crunchy nibs fit right in with the biscotti’s crunchy texture, and the flavor really amps up the intensity of the chocolate. Also, I think they give you a little jolt of caffeine, which makes these an extra perfect treat for the morning! They aren’t super crunchy like your average biscotti (at least my batch wasn’t, which was fine by me). The peanut butter flavor still came through even though I used such dark chocolate. They were really pretty perfect and I think one of the best biscotti I’ve ever had. The Peanut Butter Biscotti recipe is posted after the break. I’ve tried a few other recipes from The PB & Co Cookbook and they’ve all been excellent, so grab yourself a copy! 2. Sift together the flour, baking powder, and salt in a large bowl. Add the chocolate chunks and nibs and set aside. 3. In a separate large bowl, use an electric mixer to cream together the butter, peanut butter, 1 cup sugar, and vanilla. Add 3 of the eggs, one at a time, until they are well incorporated. Slowly add the dry ingredients to the wet, continuing to mix until the dough is smooth. 4. Divide the dough into 2 portions, and form each into a log approximately 3 inches in diameter. Place the logs on an ungreased cookie sheet about 3 to 4 inches apart and flatten them slightly with the palm of your hand. Beat the remaining egg and brush onto the top and sides of the logs. Sprinkle with remaining 2 Tbsp sugar. Bake for 25 to 30 min (mine needed a little longer) or until golden brown. Keep an eye on the bottom to make sure the loaves aren’t burning. Remove from oven. 5. Reduce the oven temp to 300. Let the logs cool for 10 min, then cut them into slices about 3/4 inch thick. Place the slices, cut side down, on the cookie sheet and bake, turning once, until crisp, an additional 7 minutes on each side. These cookies will stay fresh for 3 to 4 months if kept in an airtight container. 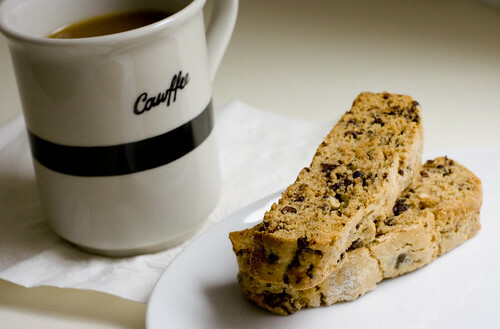 I’m not a big biscotti fan, but one look at the name and picture and you drew me right in! 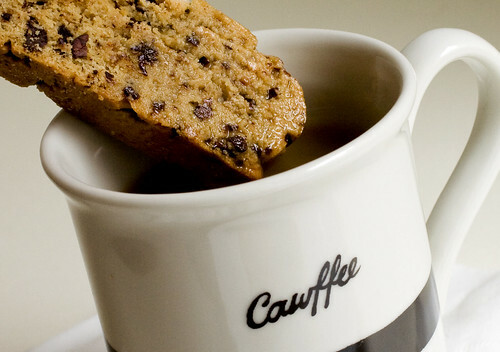 This sounds fabulous and a biscotti I’m sure I will love. I have read to this point from the beginning of your blog and I love it. It is fun and fascinating. Who would have thought how much PB and C there is out there?